Our current litter of 6 pups is sold out. Our next planned litter will be a breeding between Danica and Newman in mid April, 2016. We are now taking reservations. 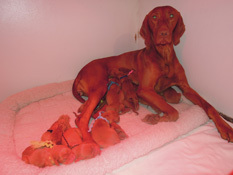 Many breeders will sell all their pups on a "co-ownership". This gives the breeder control over what happens to the pup in relationship to titles, health checks and breeding. Each breeder will draw up a contract which lays out what is required from both parties and it is the breeder's guarantee that only the best will be bred. First of all, a co-ownership means that you are getting the best overall pup from the litter (in my opinion) - conformation, energy level, attitude and field potential. It also means your pup will have the opportunity to earn his/her Canadian Championship in the conformation ring as well as at least one field title - to do what he was bred for. This will be done with the help of Professional Handlers we know and trust. Each pup will be sold on a contract that would be mutually agreeable to both buyer and seller and would include our standard guarantee, return policy and requirements if you plan on breeding. All our other pups are sold on a CKC Non-breeding Contract .